Have you (or anyone) tried using butterscotch buttercream for the frosting instead? I’m in Texas and it’s always hot so I don’t want to make anything cream/pudding based. 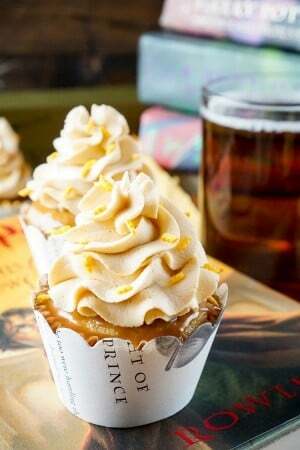 I’d use the same butterscotch sauce to flavor the frosting. Thoughts on this? I’m so glad they were a hit, that frosting is pretty addictive, eh? And a religious experience… I’ll take it! Yay, I’m so glad you all enjoyed it! These baked beautifully! The frosting is gorgeous, not too too sweet. I didn’t end up getting any sprinkles, so instead I drizzled mine with some of the leftover butterscotch sauce and then topped every other one with glasses and lightning bolt cupcake toppers I bought on etsy. I’m taking them to my Harry Potter themed New Year’s Eve party tomorrow and I’m sure everybody’s going to love them. Thanks. That sounds like an awesome NYE party to me! I hope everyone enjoys the cupcakes! I made these today and they were wonderful. My frosting turned a golden brown because of the butterscotch pudding. What brand do you use for your pudding because yours is a cream colored frosting? Hi Sarah, so glad you enjoyed the cupcakes. I use Jell-O brand. Not sure why it might have turned out darker. Hello! I have made these before and absolutely fell in love. I was wondering if you could perhaps tell me how to adapt them for high altitude? I Just moved to Colorado and can’t figure it out ha. Thank you! Hi Jessi, I’m really not sure since I’ve never baked at high altitude. I would recommend googling it and doing some testing. I tried your recipe today and the cupcakes tasted fine, but they stuck to the wrapper quite a bit. I think the batter was too wet and I’m wondering if I can skip the cream soda in the recipe? 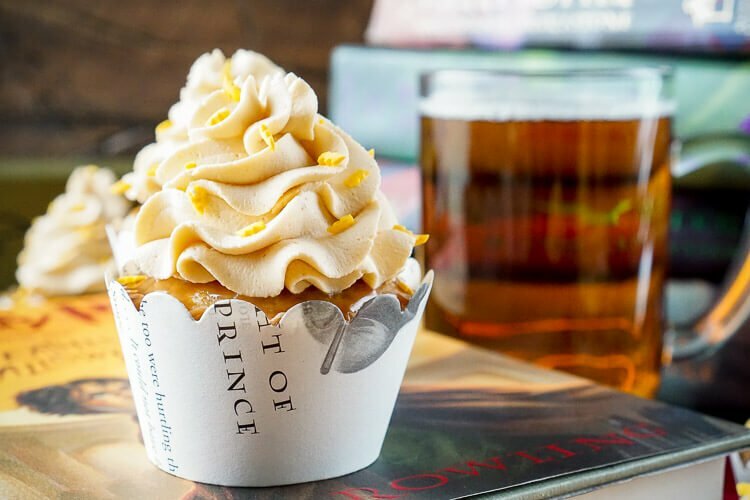 I can’t imagine it adds much to the flavor of the cake, since the vanilla and butter extracts are so strong. Is the cream soda necessary? Hi Barbara, I’m sorry this recipe didn’t work for you, but yes, the cream soda is an essential part of the recipe. Removing a 1/2 cup of liquid from the recipe would change it quite a lot. I’ve never had issues with them sticking to the wrapper and many people have made this recipe and never mentioned it being an issue. Hi Sue, personally, I would be hesitant to make these for a bake sale, especially if it’s outside during the summer. Because the frosting is whipped cream based, if it gets too warm it can easily deflate and separate and should be refrigerated if not enjoying the same day. My biggest concern would be that those who might buy them might not realize this and be left with an unedible cupcake if they have other errands to run and it gets left in a hot car. 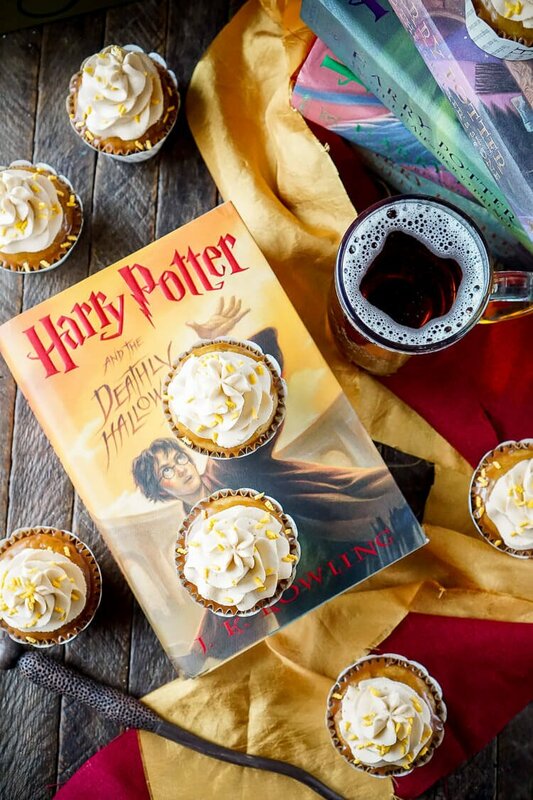 I would recommend trying my Butterbeer Cookies instead, they will hold up to time and travel much better. My granddaughter & I made these today and while the cupcakes & butterscotch topping were great, the icing is not a good recipe. There needs to be way more powdered sugar to stiffen the icing or it is still slightly runny at the point the mixture begins to turn to butter! We made the icing 2 times & while it was stiffer the 2nd time, the recipe still needed more powdered sugar. We couldn’t find any of the lightening bolt sprinkles so we did as someone else suggested & drizzled a lightening bolt design on top out of the butterscotch topping. They looked cute to my 8 yr old & tasted great. i also had a hard time with getting the icing out of liquid form?.. Hi Tiff, were you using a hand mixer or stand mixer? It takes a few minutes but as long as you’re using a COLD heavy whipping cream it should whip up without issue. Did you use INSTANT pudding mix? I think that makes a big difference, a cook and serve might cause the whipped cream to stay cream? I don’t know, I didn’t have any issues with it (other than we served them on a crazy hot day, and things sort of melted/sogged…but didn’t matter, they were still amazing!) I wonder if location/sea level matter? Yes, INSTANT is an absolute must. So I couldn’t find INSTANT butterscotch pudding mix for the frosting, all I could find was the cook & serve, would that make a difference? It’s still in a powdered mix form in a box, but has anyone tried it with this type of pudding mix? Will it work? Please help! I would’ve ordered it from Amazon, but it won’t get delivered til Saturday and that’s when I need it by! The party is Saturday! Thank you!! Hi Sabrina, I have never tried it with cook and serve, but I don’t believe it will work. 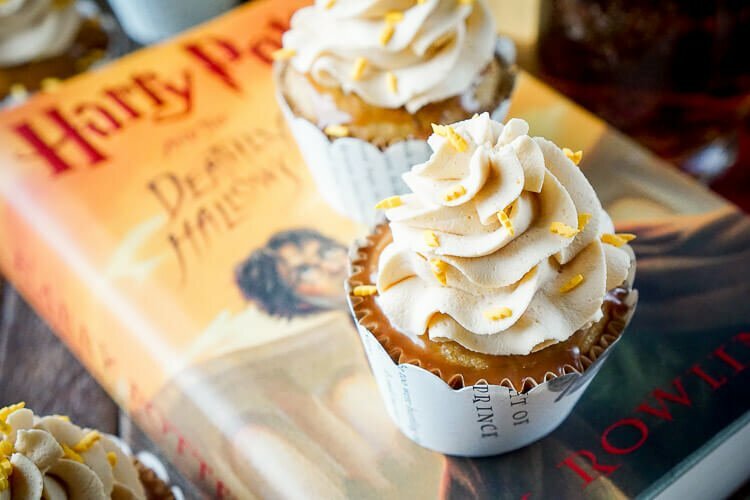 If you are still able to run out to the store, I would use an instant vanilla pudding and either butterscotch flavoring or just a drizzle of the ganache over the top of the frosting. Made these for work. Filled each cupcake with either red, blue, green or yellow frosting. 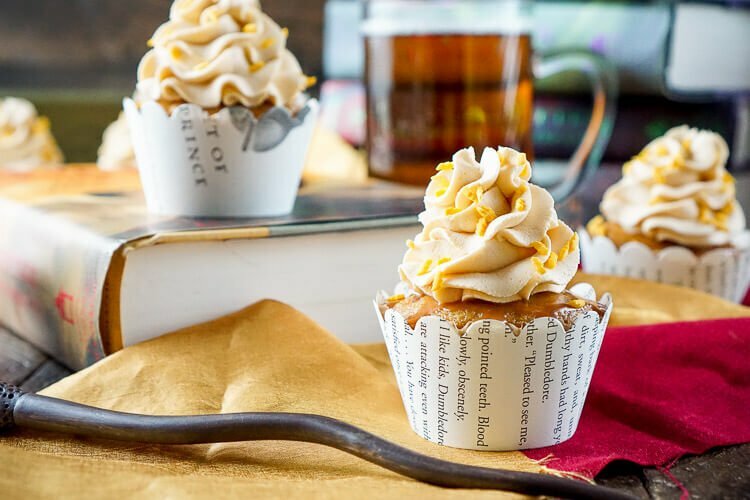 Called them “Sorting Hat” cupcakes….whatever color filling is revealed determines the Hogwarts House you belong in. They were a huge hit. I’m so glad they were such a hit! I love the idea of the sorting hat too! 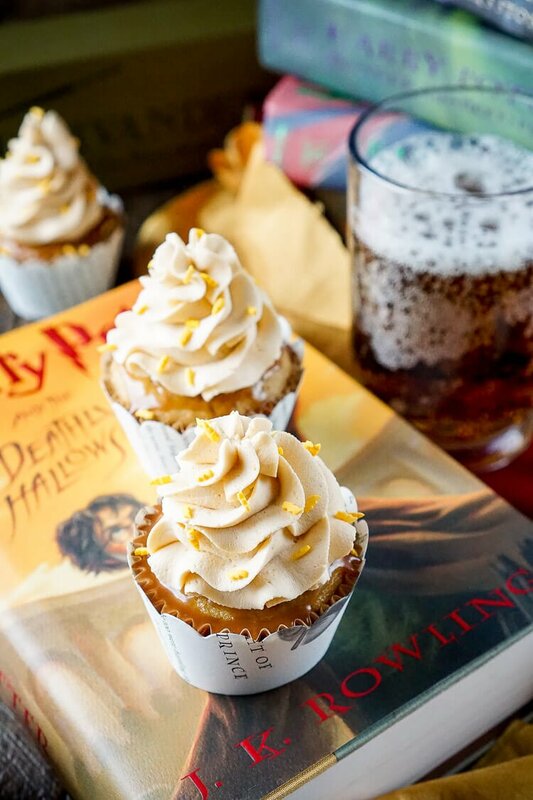 I’m going to make these for my Harry Potter themed going away party in a few weeks, but my house has no air conditioning and it’s a little warm inside. Would you recommend changing the frosting since it’s whipping cream based? I wonder if I could make it a buttercream somehow instead? Also I was thinking of adding food coloring to the frosting to make the colors for the 4 houses! I’m so excited to try these!! Hi Michael, I think it really depends on where you live. I would imagine that in places like here in New England, the heat will have dissipated a bit in a few weeks and the frosting from the recipe would be fine to use. You can always make the original recipe frosting and chill them as well. 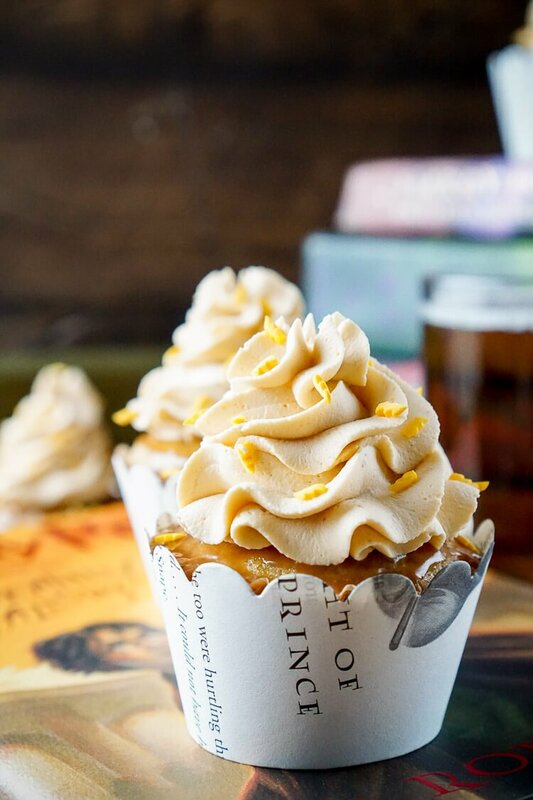 A great alternative would be to make a classic buttercream and add some butter extract to it, I have a recipe here: https://www.sugarandsoul.co/classic-vanilla-buttercream-frosting-recipe/ and then drizzle some butterscotch sauce over the top to reach punch the flavor up a bit. So, this recipe was more involved than a lot of things we make at my house, and we are the people who try not to use artificial flavors. We followed the recipe exactly, though. It worked perfectly from a baking standpoint. The cupcakes were beautiful but SO SWEET and the frosting so rich that none of the 10 of us (7 of whom are kids) actually liked them. I think just substituting some cream soda into a vanilla/yellow cupcake recipe and adding toffee or a tiny bit of butterscotch to buttercream would have been as, if not more, effective – at least for kids. Thanks for the ideas, just the same! The store only had the cooking kind of butterscotch pudding so I got that and then saw the comments about needing it to be instant when I was about to make the frosting. So I partially whipped the cream, added the powdered sugar and flavoring and then whipped almost completely. I slowly sprinkled on the pudding powder and beat it in a bit at a time. It turned out fine although I did think it wasn’t quite sweet enough and added a bit more powdered sugar.